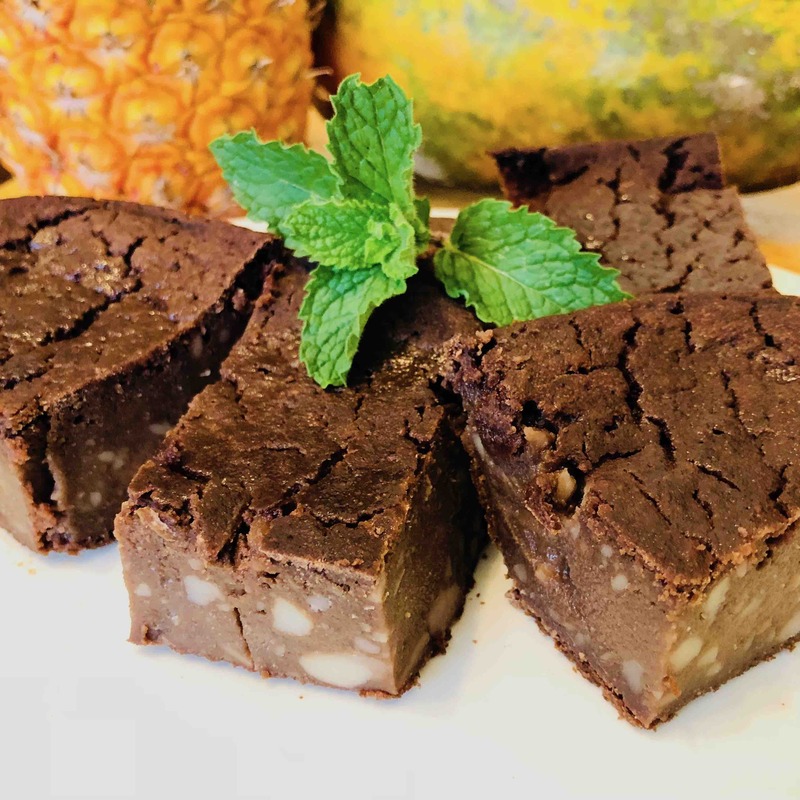 Here is an amazing fudge brownie recipe that is guilt free. It’s easy to make and good for you… and Taro Root has a glycemic index of 20… very low. And full of the goodness of Taro Root which has a super low glycemic index and contains lots of vitamins and minerals. Plus these brownies have a luscious fudge brownie flavor and consistency that you will love. And I know what you are thinking – But they really do taste GREAT! 12 – Oz of Organic White Beans of Any Kind with Liquid – Blended – Makes the Brownies Super Moist without adding any flavor. 1 – Cup of Filtered Water to Mix Batter – Use more if needed more. Add just enough water to mix all the ingredients together easily, until smooth with a mixer. I left my taro root a little bit chunky to give the brownies a bit more texture and 2 tone look… and they taste great. But you can blend your taro root with a little bit of water and have a totally smooth texture if you like. Pour the batter into an 8 x 8-inch baking pan and bake at 400-degrees for 1 hour or until the middle starts to rise up a bit. Remove from the oven, let cool completely. Sometimes I bake these brownies in the evening and let them cool a bit. Then I place the pan in the fridge overnight so the brownies set up really well… then they slice easily… if you can wait that long. Organic Taro Root or Yautia as it is called in Latin Countries, and Dasheen Roots as they are called in Hawaii, Eddoe as it is called in Japan, India, and China, and grows all over the world, even in the US, and it’s a wonderful healing food that has many uses… and has more health benefits than potatoes. They have a very low glycemic index making them great for diabetics, long-lasting energy, weight loss food, lots of vitamins, A, B’s, C, and Vitamin E, has lots of copper, magnesium, calcium, iron, selenium, manganese, zinc, potassium, beta-carotene, cryptoxanthin, and antioxidants, and Omega 3 oils and they contain 17 different proteins, much better than potatoes. Taro roots help with irritability, and lower blood pressure, they help prevent cellular damage, help to protect a person from colds and flues, help with skin rashes, nausea, and also helps to regulate cholesterol, and build strong bones, plus they support thyroid function.And Taro Roots can be mashed, boiled, fried, made into chips, and used in casseroles, soups, stews, used in baking, and so much more. And they are really creamy and tasty! Remember – Always Eat Organic – Regular fruits, veggies, and grains contain up to 6 cancer-causing chemicals, 12 hormone-disrupting chemicals, and 10 other disease-causing chemicals – Not Good – Eat Organic and Stay Healthy! This entry was posted in Healing Herbs, Recipes and tagged 8 x 8-inch Baking Pan, Almond Flour, and contains lots of vitamins and minerals, And full of the goodness of taro root, Aqua Faba, Baking Powder, Baking Soda, cocoa powder, Cooked Taro Root, Dr. Haider’s Fudge Brownies with Taro Root, Dr. Paul Haider, Filtered Water, fudge brownie recipe that is guilt free, Full of Vitamins and Minerals, great for diabetics, Having a Great Life, Healing, Health, HH, It’s easy to make and good for you, low glycemic index, luscious fudge brownie flavor and consistency, Master Herbalist, Oatmeal Flour, Photo, Recipe, Salt, spiritual teacher, super low glycemic index, Tapioca Root Flour, that is sure to be a hit, USA, Vanilla Extract, White Beans, white vinegar, Whole Foods Plant Based Recipe. Bookmark the permalink.